On Thursday, June 16, 2016 at approximately 3:42 p.m., Monterey Park Police Department officers responded to 2343 S. Garfield Avenue regarding a victim of a stabbing. Upon arrival, officers discovered that the business owner at the location had been stabbed by an unidentified male suspect. The suspect, who entered the store which was open for business, stabbed the unsuspecting victim without provocation and made no demands and fled the area on foot prior to police officers arriving and was not apprehended. The victim was transported to an area hospital by Monterey Park Fire Department paramedics where she was treated for her injuries. 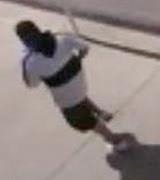 The suspect is described as a male Hispanic, heavy set, shaved head, approximately 5 feet 8 inches to 5 feet 9 inches, wearing a white shirt with large blue horizontal stripe, dark colored shorts, backwards facing baseball cap and a blue bandana covering his face. The Monterey Park Police Department is requesting the community’s assistance in identifying and locating the suspect or any information that may assist us in this investigation. If you have additional information on this crime you can contact the Monterey Park Police Department Investigations Bureau at 626-307-1236, the on duty watch commander at 626-307-1200 or Crime Stoppers at 800-222-TIPS (8477).